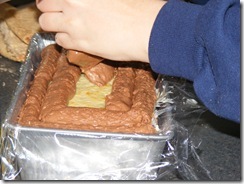 Home » Daring Bakers - French Yule Log! 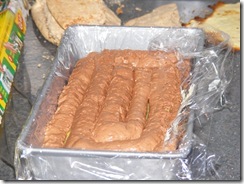 Daring Bakers - French Yule Log! 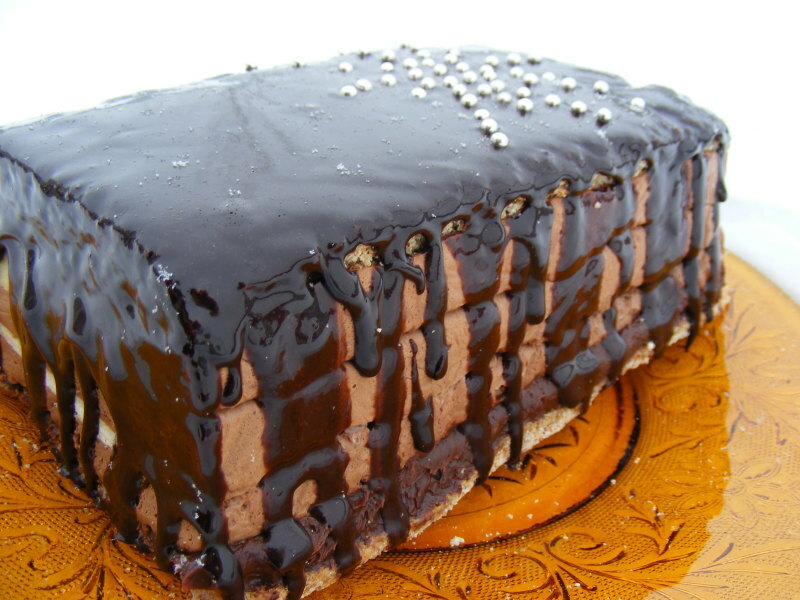 So I had good intentions of making this for dessert for Christmas Eve. But then life happened. Tim worked right up to Christmas Eve which made it hard to do this with a baby in the kitchen so I didn't get started until boxing day. I made the Crème Brulée that day and then planned to make the rest following but that didn't happen either so my poor little brulee sat in the freezer for a few days by himself. I am happy to report that he is doing well now that he had joined his buddies! But... I'm not done quite yet! I had a miscalculation (didn't read fully) and put the dacquoise on the top of the log as opposed to the bottom, which means I needed to make more (which is ok because the leftovers are so yummy!). So I have made more dacquoise and it is ready to go when I get the ganache done. 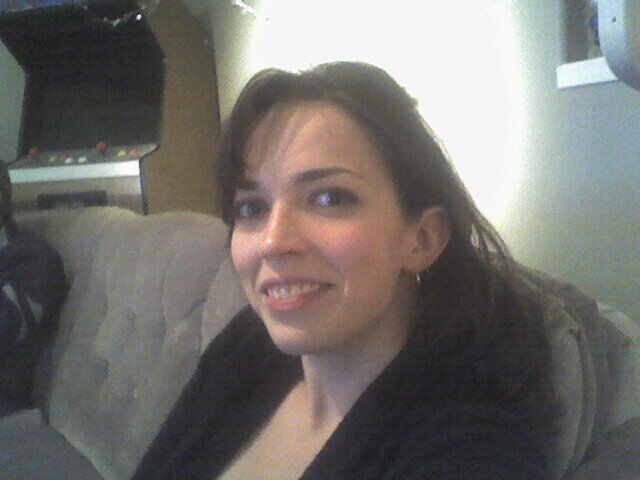 I burnt my caramel (yeah, I know bad me) so I'm going to try again after my little man is in bed. Hopefully it will work better this coming time and I will be able to finish tonight! I am SO looking forward to enjoying this one as it has been the most exciting I think to date for me and I can't wait for more Daring Baker's challenges in 2009! Isn't it beautiful?! I love it. I can't wait to try it out on more things. It's like having that extra third arm I've been looking for since my little man was born! Just in time for the other one to come out and make day to day life even more challenging! That's ok though, I can't wait for this new little person to make their appearance. We've even decided on a name and sorted the baby clothes last night. Ok, I'm getting side tracked. SO, what is a French Yule Log you say and how is it different from the Yule Log we made last December if you were a member then? 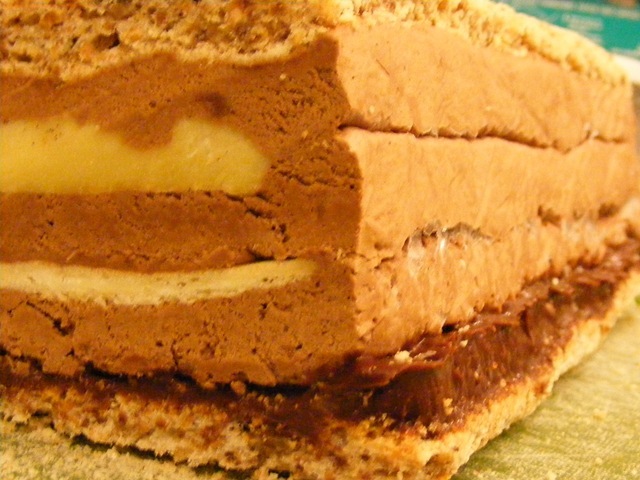 In France you can buy two kinds of Yule log, either the Genoise and Buttercream type that we made last December, or what is more commonly purchased which is a frozen Yule Log very reminiscent of an ice cream cake, only often it’s not made of ice cream but rather frozen mousse of some sort. In French this is called an entremets which is sometimes loosely translated in English as simply a cream dessert. This also means that this recipe is not holiday-specific, it is also just a scrumptious dessert recipe. This recipe comes almost entirely, except for one small labeled portion and some of the variations courtesy of our dear Daring Baker Fairy Tartelette, from the website: Florilège Gourmand (address above) which belongs to Flore (who has not disclosed her last name to me in my exchanges with her) and is unreal. 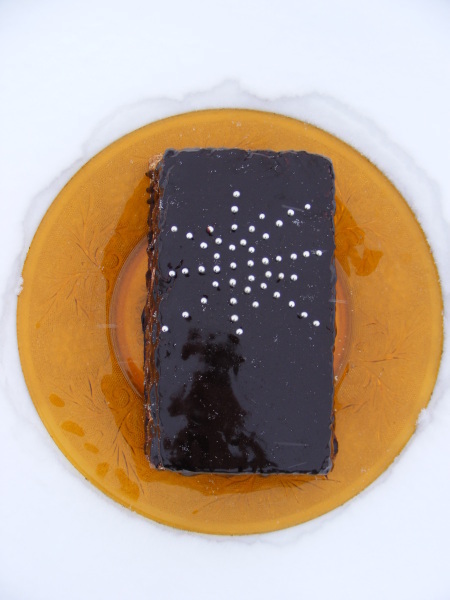 Her website is in French and different portions of the recipe have been pulled from the recipes in the entremets section. #1 DO NOT PANICK when you see that this document is 18 pages long. The actual recipe is not 12 pages long, it’s more on the order of 3-4 pages once you choose your flavors. Marion and I believe in Culinary Freedom and wanted to make this as fun and accessible as possible for everyone around the world. 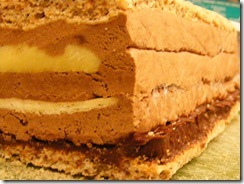 Element #1 Dacquoise Biscuit (Almond Cake) I made hazelnut, toasted hazelnut if you want to get exact! 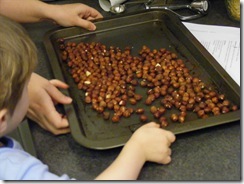 Little man helping me to get the hazelnuts ready for the oven. 1. Finely mix the almond meal and the confectioner's sugar. (If you have a mixer, you can use it by pulsing the ingredients together for no longer than 30 seconds). 6. Spread the batter on a piece of parchment paper to an area slightly larger than your desired shape (circle, long strip etc...) and to a height of 1/3 inches (8mm). Now...since it is baked in a pan and it is sometimes difficult to find another large pan to set it in for a water bath, even a small amount of water in your water bath will help the heat be distributed evenly in the baking process. Even as little as 1 inch will help. This is what it looks like in it's current state. I will edit the post after I have done the icing to show you all how it looks finished! I cut a small end of so that you could see the layers. I'm putting this picture here because I haven't technically done the icing yet but it will be done tomorrow! 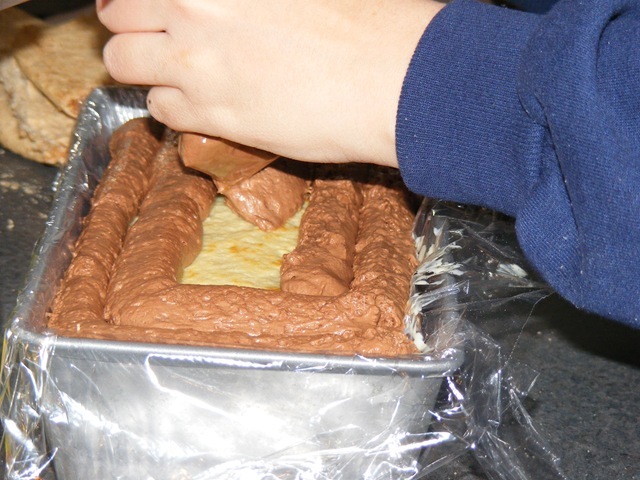 4) Mousse (This is when the picture was taken, I was cooling my crisp insert by waving it around the kitchen as it had just come out of the oven). This picture is step 6 from above. After my crisp insert went in. 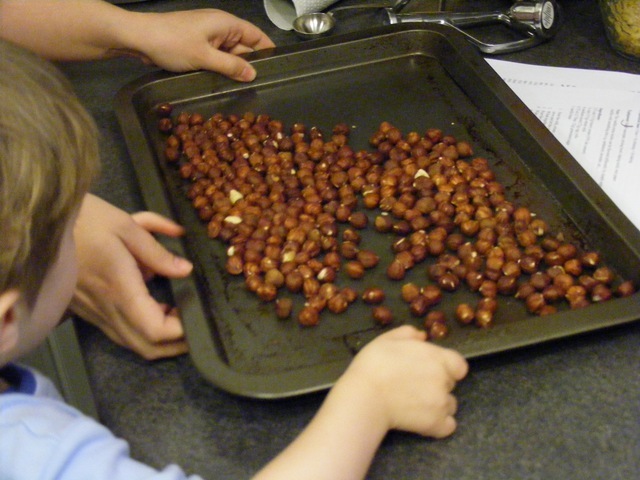 Yeay, I'm so pleased you enjoyed this challenge with a little man in the kitchen and another little person on the way. (It's really nice to read that this was your favorite challenge so far). I'm sure the finished product will look great and I'm pretty positive that that external ice box of yours will freeze it much faster than the kitchen freezer (just beware of freezer burns, don't leave it out too long). Have a happy New Year and congratulations on the impending arrival! 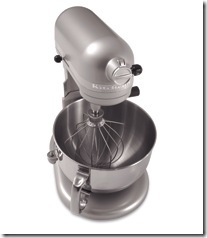 On your yule log and your new mixer! 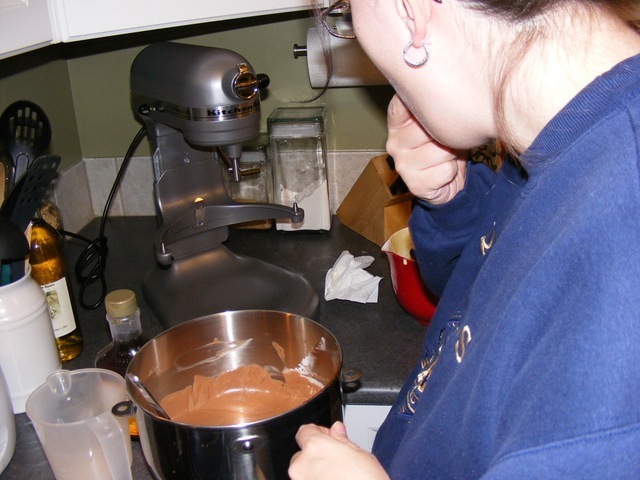 I love my standing mixer!